Using touch is awesome with Windows 8, but to do that, you've got to have a screen with touch. Duh. And unless you've got a brand new laptop, you're out of luck. But Lenovo's got something for you: a portable touchscreen monitor. 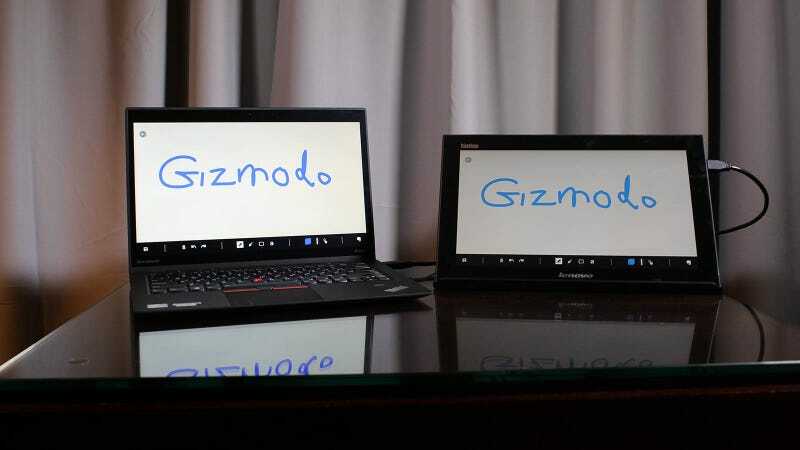 The Lenovo LT 1423 and LT 1423 Wireless is a 1600x900 LED monitor—it's been available without touch for a while—that connects via microUSB 3.0 or over a Wi-Fi network. The wireless is especially cool, since you can use it as a client to control your computer remotely. It'll get four hours of battery, with the wired version apparently draining your laptop "minimally". Both models weigh under two pounds; the wired version is $350, and the wireless is $450. They'll be out later this year—the wired will be out this quarter, and the wireless is out in June.